I have a lot of thoughts about washing dishes, especially since I generally make all of our meals from scratch. For a family of five, that adds up to a lot of dishes, and I'm running the dishwasher daily! 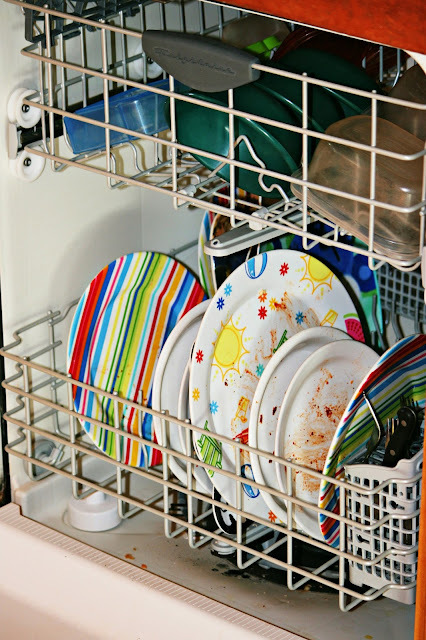 Prior to living in our current house, I did a seven year stint with no dishwasher, and I particularly loathed the winter months when the pipes would freeze and dirty dishes would pile up in the sink. I sure am glad those days are past. I have never tried Cascade Platinum though. In the coming weeks, I'll be putting Cascade Platinum to the test, and I'm eager to see how it will handle load after load of messy dishes. I'm especially interested to see how it handles our glassware - in the picture above you can see that the dishwasher is mostly loaded with plastic kiddie plates and lunch tupperwares. But we do have glassware and I want to see how clean my wineglasses and plates can be. Cascade Platinum is supposed to leave dishware spot-free and prevent buildup on dishwasher walls - all while providing the most powerful clean Cascade has to offer. For information on Cascade Platinum, visit out their Facebook page! Readers, how often are you washing your dishes? This sounds great! I look forward to hearing what you think about it. When we sold our house and moved to this apartment, we could not bring our automatic dishwasher with us. So I became a dishwasher. Between the two of us, we do dishes a couple of times a day, occasionally more. I don't mind doing dishes. It is mainly a mindless activity, and some of my better blog posts come together when I'm doing dishes. I have never tried Cascade Platinum, but then I quit using my dish washer because all the dish washing liquids and powders I used seemed to scratch my dishes eventually and make them look old and ugly. I am going to keep checking and see how you are doing with this. I couldn't live without my dishwasher. Oh yeah...I did. For 6 months with a newborn. That was not fun. Have fun, and good luck with your dishes! Now--I seldom use the dishwasher --but prefer to wash them by hand. I wash my dishes as I go --and George dries them. SO--we seldom have ALOT of dishes to wash at one time. IF we have company or a big meal (like Thanksgiving) --I definitely use the dishwasher. Frozen pipes and no dishes does sound outrageously obnoxious. Glad that's over for ya! Congrats on being selected to be in the program! How exciting! I do use the dishwasher quite a bit as well since I cook from scratch. I run it at least every other day. Can't wait to hear your opinion on the products! We probably run our dishwasher every other day. I like a powdered detergent. I'll look forward to hearing about your results! We have a full dishwasher every day too.. and I know I'm spoiled to say this, because I grew up in a house without a dishwasher, but I don't know how you did seven years without one!... I hope I never know that woe again! I'm going to try making my own dishwasher soap after I run out of the tons of Costco pellets I got. They get stuck in the little dish soap door. It happens too frequently. With just two of us, and not a lot of cooking going on (:-() we run the dishwasher once or twice a week. But we don't put the kitty bowls in it to preserve the rubber around the edges. So we handwash those. Not my favorite thing to do. We have never owned a dishwasher. I would like to get one but now the kids are all gone but one I don't see the need. I do wash dishes about three times a day. Our old farm house does not have a dishwasher either,. We wash dishes once a day. i have 6 kids. We wash a *lot* of dishes. We use a biodegradable dish washing fluid from Costco - Kirkland brand. All I know about dishes and dishwashing is that back in the day when I worked at Colonial WIlliamsburg's retail shops, the rep from silverware company told us to tell clients not to use lemon scented dishwashing detergent. It pits the stainless steel in the blade of the knives. Also - never wash real silver and stainless in the dishwasher together. I never wash real silver in the dishwasher anyway, but supposedly you can, just not with the stainless. That is about all I know about dishes!